Lately, I've been approached to do some videos for various media outlets and online 'channels.' I have to admit, I'm not a huge watcher of online videos- yet. Are you? I'm told that this is where the online world is headed... all aboard! Next week, a film crew from TheDaily.com will be coming to my house to film a couple of videos about 4th of July Entertaining tips. So, I've been doing some research on what I think seem to be great examples of online videos. Of course, I turn to the #1 resource for everything... Martha Stewart. The Everyday Food team at Martha Stewart has recently released a new online video series called "Everyday Food with Sarah Carey." 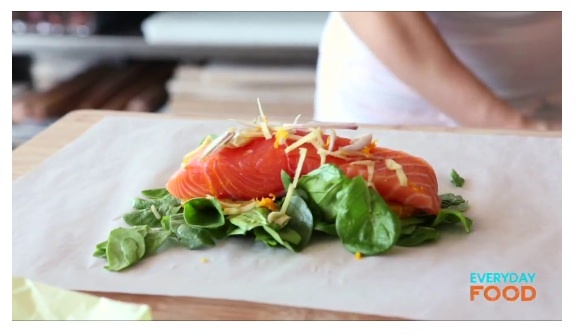 In this video, Sarah assembles a Salmon in Parchment recipe that is similar to my Shrimp & Scallop in Parchment recipe posted a couple of months ago. So... if you had any questions about the method of assembling my recipe, this video should help you out... as well as give you inspiration for another version. I think I'm going to try a version of this tonight with Salmon, Garlic & Lime. I'll let you know how it goes! I learn how to do so many things through videos. Its just like in school, some people do great at reading how to do something, some people want to actually see it being done. I think videos save a lot of time in the busy online world. I haven't really watched too many food how-to videos, more diy, building videos. But how SUPER exciting for you to be doing this! Good luck, you will be fantastic!! They are right - the future is video. I am excited that you will be starting video. You are going to be amazing. I can't wait to watch. Also - Emma is the cutest most perfect baby on the planet!! I don't watch many videos, but I do watch Everyday Food every day! Much easier to learn when you can watch, too!